SUMMARY: After sister mysteriously vanishes, fifteen-year old Izzy Brannick and her mother move to a small town to banish a suspected ghost that recently attacked a high school teacher. To figure out what's going on, Izzy enrolls as a high school student and joins a school club aimed at investigating paranormal activity at the school. REVIEW: Sweet, cute, fun! I am a huge fan of the Hex Hall trilogy, and I definitely plan to read the sequel to School Spirits. The story is very different from Hex Hall, but I loved it just as much. Izzy's character is funny and self-deprecating, and I loved the inclusion of Torin the mirror man. I have a feeling we'll be seeing much more of him in the sequels. I loved Romy as Izzy's new best friend, and Dex is the perfect love interest for Izzy. I loved the little twist on their romance at the end--will make for a fun sequel! The ghost story itself may be a little creepy for more sensitive readers. I've read lots of horror novels, and reading this at night had me a little creeped out. It isn't scary, but readers who are easily frightened have been warned. This will be an instant hit with my middle school girls, and I will likely need multiple copies. THE BOTTOM LINE: Fun and fabulous! 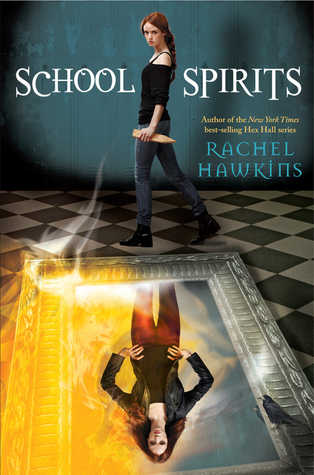 If you loved Hex Hall, you'll love School Spirits. The stories follow a similar story arc, but the characters and plot are different. STATUS IN MY LIBRARY: I have zero doubt that my MS girls will be all over this the second I get it in. I've already pre-ordered one copy, but I'll be adding at least two more. The Hex Hall series has been consistently popular in my school for the past two years, and I recommend them often. The story is very clean, perfect for a middle reader or a low-skilled young adult reader. It has a great amount of action, the dialogue is witty, and Izzy is a trip. It would catch any kid's attention. I look forward to more of the Brannicks to come, and in particular, to have a chance to watch Izzy come into her own!